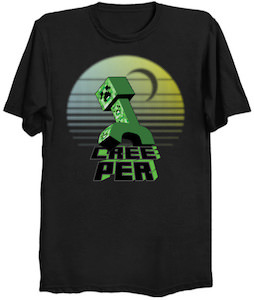 If you like Minecraft then you want to check out this Minecraft creeper t-shirt. On the t-shirt you can see a circle and to me it looks like a sunset and in the middle you can find the famous green creeper that we all hate so much as it always seems to blow things up when you don’t want it. Below the green creature it says “Creeper” so that everyone know what it is. The t-shirt is availble in black and light gray and come in many styles for men, women, and kids and in a wide range of sizes going all the way up to 6XL. Come get your own Minecraft Creeper T-Shirt.